Over 50,000 people have been detained, fired or suspended from their jobs by Turkey’s government in the wake of last week’s failed coup. The purge of those deemed disloyal to President Recep Tayyip Erdogan widened on July 19 to include teachers, university deans and the media. According to the government, they are allied to US-based cleric Fethullah Gulen, who denies claims he directed the uprising. Turkey’s Prime Minister Binali Yildirim said Fethullah Gulen led a “terrorist organization”. “We will dig them up by their roots,” the prime minister told parliament. Turkey is pressing the US to extradite Fethullah Gulen and the issue was raised during a phone call between President Barack Obama and President Erdogan on July 19, the White House said. White House spokesman Josh Earnest said a decision on whether or not to extradite would be made under a treaty between the two countries. A Turkish government spokesman suggested that the US should be able to extradite Fethullah Gulen “on grounds of suspicion” rather than requiring facts of the case against him. 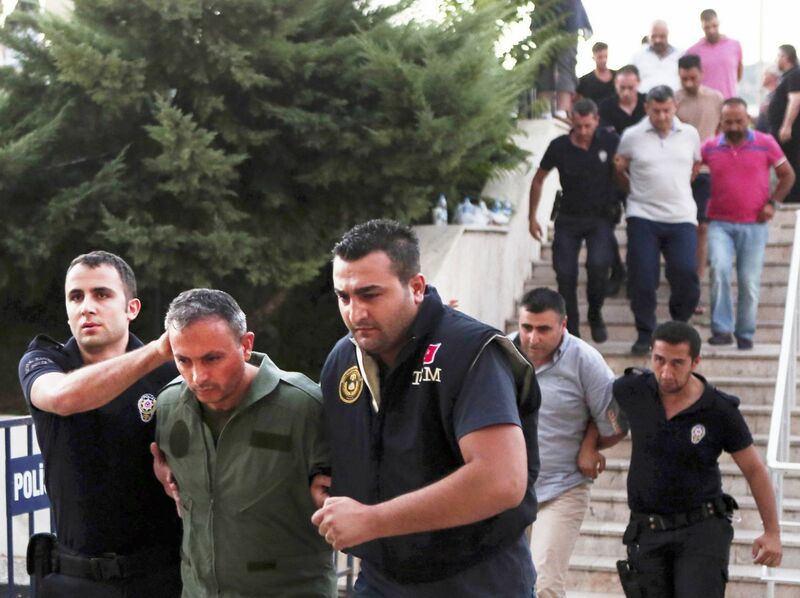 “There is very strong suspicion for his [Fethullah Gulen’s] involvement in this coup attempt. So this is sufficient grounds,” said spokesman Ibrahim Kalin. For his part, the preacher says claims he was behind the coup attempt are “ridiculous”. “I urge the US government to reject any effort to abuse the extradition process to carry out political vendettas,” Fethullah Gulen said in a statement. Recep Tayyip Erdogan is due to chair meetings of his national security council and cabinet in the capital, Ankara, on July 20, after returning to the city for the first time since the attempted coup. The meeting will be Erdogan’s first chance since the coup attempt to sit and talk in person with all key members of the government and armed forces. His task is to re-impose stability amid the turmoil and to reassure the country and Turkey’s allies abroad that he is not embarking on a witch-hunt against his many critics. The Pentagon said that talks also took place on July 19 between Defense Secretary Ash Carter and his Turkish counterpart, regarding the Incirlik air base in southern Turkey. The base is used by the US-led coalition fighting ISIS in Syria and Iraq. Meanwhile, the Turkish government crackdown widened on July 19 to include the education sector and government departments. According to Turkish media,15,200 teachers and other education staff had been sacked; 1,577 university deans were ordered to resign; 8,777 interior ministry workers were dismissed; 1,500 staff in the finance ministry had been fired; 257 people working in the prime minister’s office were sacked. Turkish media regulation body also revoked the licenses of 24 radio and TV channels accused of links to Fethullah Gulen. The news came on top of the arrests of more than 6,000 military personal and the sackings of nearly 9,000 police officers. About 3,000 judges have also been suspended. The removal of thousands of officials has alarmed international observers, with the UN urging Turkey to uphold the rule of law and defend human rights. A senior German official said on July 19 that “a deep split” had opened in Turkey, and he feared the divisions would cause unrest among Germany’s large Turkish community. “The danger of an escalation in violence between Erdogan supporters and opponents has also risen in Germany,” Bavarian Interior Minister Joachim Herrmann told the Berliner Zeitung newspaper. President of the European Parliament Martin Schulz has accused Turkey of carrying out “revenge” against its opponents and critics. He also said a debate around restoring the death penalty was “deeply worrying”. The EU has warned such a move would end talks over Turkey joining the bloc. According to official figures, last week’s coup attempt left 232 people dead and 1,541 wounded.